This book provides a descriptive, progressive narrative on the flipped classroom including its history, connection to theory, structure, and strategies for implementation. Important questions to consider when evaluating the purpose and effectiveness of flipping are answered. 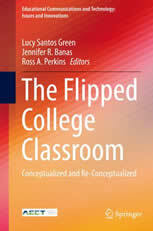 The book also highlights case studies of flipped higher education classrooms within five different subject areas. Each case study is similarly structured to highlight the reasons behind flipping, principles guiding flipped instructions, strategies used, and lessons learned. An appendix that contains lesson plans, course schedules, and descriptions of specific activities is also included.